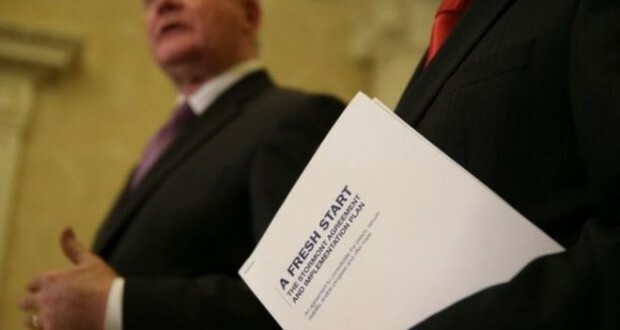 The new deal agreed by the DUP, Sinn Féin and the British and Irish governments has been optimistically entitled ‘A Fresh Start’. Peter Robinson has said that the main political parties believe that the agreement will “consolidate the peace, secure stability, enable progress and offer all our people hope for the future.” Martin McGuiness went further, saying that the agreement “signals our resolve to engender the sea change that our community is demanding.” In reality, it marks a deepening of austerity and a perpetuation of sectarian division. There is no fresh start in this agreement for workers and young people. The Stormont House Agreement of one year ago was initially thrown into doubt when Sinn Féin withdrew its support for the deal made on welfare ‘reform’. Sinn Féin stated that others had failed to live up to their commitments and party representatives like Conor Murphy claimed it had been their understanding that no current or future claimants would lose out, effectively rendering welfare ‘reform’ pointless. 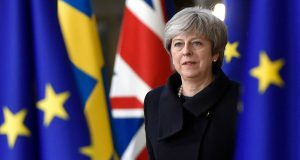 In reality, this backtracking reflected concerns about the impact that introducing brutal attacks on the poorest and most vulnerable in society could have on the party’s carefully cultivated image as an anti-austerity force in the South. After months of bombastic posturing on the issue, we now have the incredible situation where Sinn Féin – along with the DUP and Alliance – has, like Pontius Pilate, attempted to wash its hands of responsibility for welfare ‘reform’ by voting to hand power to implement these vicious cuts to the Tories at Westminster! Sinn Féin would boast that they have secured £585 million to mitigate against the effects of welfare reform over the next four years. These boasts do not match the reality. Of the £585 million fund, £240 million was originally earmarked to compensate for the impact of the planned Tory cuts to tax credits, which were not covered by the Stormont House Agreement. Based on Department of Social Development figures, this would still have seen workers in Northern Ireland worse off to the tune of around £30 million each year. The remaining £345 million was earmarked to mitigate against the introduction of the 2012 Welfare Reform Act over four years. This works out at over £200 million less than what was negotiated at Stormont House last year, the deal Sinn Féin reneged on with Martin McGuinness saying an extra £200 million was needed! Under pressure from Tory backbenchers and Lords who feared the reaction it could provoke, George Osborne has since shelved plans to cut tax credits, although they will be phased out and replaced with Universal Credit, the precise impact of which is unclear. Now, the full £585 million fund established by ‘Fresh Start’ could be used to compensate for welfare ‘reform’ but it still falls far short of the estimated cost of the cuts. Sinn Féin themselves estimated that £122 million per year would be lost by claimants in just two of the North’s eighteen constituencies, Foyle and Upper Bann. This represents a dramatic retreat for the party’s previous position that no one would lose out! When these measures run out in four years – rather than the six originally agreed at Stormont House – nothing is guaranteed and the full impact of these attacks on welfare are likely to be felt. The evidence is there as to the effect it will have. A recent report in Britain found 590 extra suicides, 279,000 extra cases of mental ill-health and 725,000 more prescriptions for anti-depressants associated with the controversial ‘work capability assessments’ between 2010 and 2013. Crucially, the £585 million is not new money from the British and Irish governments. Rather, it is to come from cuts to other Stormont departmental budgets, including from the discretionary social fund which provides loans for urgent, essential spending to people on benefits. Cuts are simply being moved around rather than wiped out. Austerity is austerity, whatever public services are targeted. The politicians have crowed about getting an extra £500 million from the British government, as well as £75 million from the Irish government to upgrade the A5. However, this is little to boast about, especially from Sinn Féin’s point of view. £188 million is tied to ‘security-related’ spending. Shockingly, £125 million is earmarked to deal with ‘error and fraud’ in the benefit system – in other words, to step up harassment on the very people who Sinn Féin have been claiming to protect! The £500 million figure is predicated upon this harassment being considerably more successful than previously in producing ‘savings’ in benefits payments. This additional funding will make no fundamental difference to the austerity to be implemented by the Assembly over the coming years. The BBC’s John Campbell stated that Stormont can expect to implement 2% total spending cuts each year until 2020. The new agreement warns of “challenging cost reduction targets” for all departments. There is also a commitment to “structural reform in the big spending areas of education, health, and justice.” This is no different from the language used by the Tories to justify cuts and privatisation. The agreement reaffirms that the Assembly will borrow £700 million to introduce an estimated 20,000 job losses in the civil service through the Voluntary Exit Scheme. This will have a devastating impact on the economy. Whether jobs are lost through voluntary or compulsory redundancies, they are no longer there for young people leaving education. Almost one in four young people in Northern Ireland are not in employment, education or training and the figure has again begun to rise. An Independent Fiscal Council is to be established. Its role will be similar to that of the Office for Budget Responsibility established by the Tories at Westminster. The membership will even have to be agreed with the Tory government! It will act as an inbuilt point of pressure for ever more cuts and privatisation, demanding that Stormont ‘balance the books’. The agreement reaffirms the Stormont politicians’ commitment to selling off important public assets, such as Belfast harbour. This could also see the profitable parts of our public transport system opened up for cherry-picking by the private sector. The agreement states that Stormont will “consider revenue raising measures if cost reductions cannot be achieved quickly enough.” These measures could take the form of increased student fees – already being openly discussed – or even of the hated water charges. The political establishment will be nervous about moving in that direction, fearing the kind of mass boycott which is currently taking place in the South. 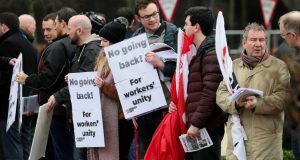 It was the mass support for a non-payment campaign – built by the Socialist Party alongside other trade union and community activists – which derailed Stormont and Westminster’s plans to introduce such a charge in the past. …Tax cuts for big business! While tax rises could be on the cards for working and middle class people, the opposite is the case for big business. While devolution of the power to set corporation tax rates was agreed last year, the new agreement, for the first time, commits the parties to a concrete level and timeframe. Corporation tax will fall to 12.5% by April 2018, in line with the current level in the South. Due to EU rules, the loss to the Treasury as a result of the corporation tax cut will have to be compensated for by a corresponding cut in Stormont’s block grant. For every pound big business gains in extra profit, a pound is lost by schools, hospitals and other public services. Figures put this cost at around £240-300 million per year. In reality, it could be much greater if major corporations register their head offices in Northern Ireland for tax purposes, creating next to no jobs. The Assembly Executive’s economic strategy is to engage in a race to the bottom in terms of workers’ pay and conditions, but also in terms of tax paid by big business. This is not a race they can win. While corporation tax in the South is currently set at 12.5%, the real effective rate of tax paid by corporations is around 6.5%. Google pays an effective tax rate of 0.25% in the South! The Department of Enterprise, Trade and Investment claims that a cut in corporation tax will create 50,000 new jobs. A great headline – but it won’t be until 2037, according to their own figures! It is likely that this number is massively exaggerated. Across Europe, big business is hoarding profits rather than investing, nervous about the extremely unstable economic situation, particularly given recent tremors in the world economy. The jobs which corporate handouts from Invest NI have attracted in recent years have overwhelmingly been low-paid and precarious. All too often, these fly-by-night investors have packed their bags as soon as the subsidies dry up. There is no reason to believe that the investment attracted by a corporation tax cut would be any different, nor that it would stop the haemorrhaging of manufacturing jobs. Tobacco firm JP Gallagher’s categorically stated that corporation tax had not been a consideration when they decided to close their Ballymena plant. They moved to Poland in search of a 50% reduction in wages! Essentially, the Stormont politicians have agreed to exchange tens of thousands of existing public sector jobs for pie-in-the-sky hopes of inward private investment in the future. This is a clear indication that the main parties have fully embraced the neo-liberal argument that the public sector in Northern Ireland is too large and that the economy must be ‘rebalanced’ through austerity and privatisation. In reality, it is the capitalist market and the private sector which has failed to develop the economy here. 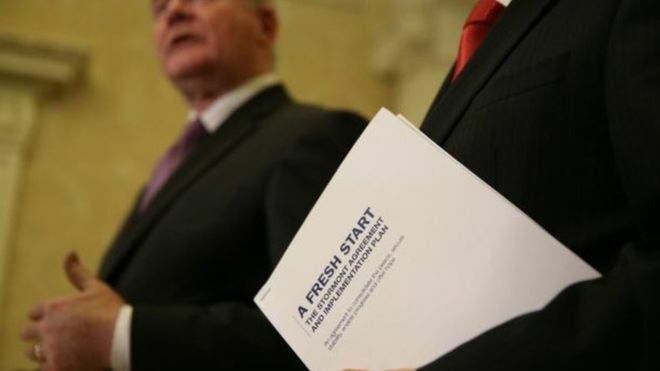 While there is clear agreement on implementing austerity, the ‘Fresh Start’ is – like all the deals which precede it – an agreement to disagree when it comes to the contentious issues of paramilitarism, flags, parades and the past. The crisis at Stormont seriously escalated after the killing of Kevin McGuigan in the Short Strand on 13th August. This killing might have quickly slipped out of the headlines but for the declaration by Chief Constable George Hamilton that he believed that “the Provisional IRA still exists” and that its members were involved in McGuigan’s killing in retaliation for the assassination of Jock Davison in the Markets area. Sinn Féin insisted that the IRA had now, in fact, ‘gone away.’ The UUP withdrew its Minister from the Assembly Executive in protest at the killing. Under pressure to look tough on the question of paramilitarism, the DUP sought suspension of the institutions. Unable to achieve this, their Ministers continually resigned and were re-appointed, disrupting the functioning of the Executive, only to take up their seats again after a report commissioned by Secretary of State Theresa Villiers confirmed what everyone already knew – that, 21 years on from the ceasefires, all the main paramilitary groups continue to exist and have the capability to carry out attacks. The new agreement will do nothing to fundamentally resolve this issue. A new international body is to be established to monitor paramilitary activity. Ministers are to take a new oath that they will be directed by no one but the electorate. In other words, Sinn Féin Ministers will promise not to be directed by an IRA Army Council which they deny exists. A committee is to report back on the questions of flags, emblems and parades, simply kicking the can down the road. No agreement was reached on how to deal with the legacy of the Troubles, which will be a huge blow to victims’ families and survivors. In the immediate aftermath of the deal, Peter Robinson’s resignation as DUP leader and First Minister was announced. We are told this is due to health problems and other pressures. It’s clear, however, that Robinson has been seen as a liability by many in the DUP for some time. His handling of the recent crisis and serious allegations levelled against him regarding corruption around the sale of NAMA’s Northern Ireland property portfolio have forced him to step down. The party will seek to distance itself from him in order to minimise potential votes lost to the UUP, TUV and UKIP. Last year, the NIC-ICTU – the body representing the trade unions in Northern Ireland – committed itself to campaign against the economic elements of the Stormont House Agreement, describing it in newspaper advertisements as “a bad deal, fit only for a land of pound shops and food banks.” On March 13th, public sector workers showed their strength by taking strike action which sent a shockwave through Stormont. Unfortunately, it wasn’t built upon with further strike action and a real campaign to fight the cuts. Instead, the consensus amongst the trade unions’ leadership was to attempt to build alliances with the Assembly parties, particularly Sinn Féin, in the hope that they would ameliorate the worst elements of austerity. They were clearly wrong and have so far remained silent on this recent agreement. To continue with their current strategy would be to disarm workers in fighting cuts and threaten to split the movement along sectarian lines. Trade union activists must organise to demand a change of course – towards rebuilding a united movement against the Stormont parties’ austerity. The lack of follow-up to the March 13th strike action has deepened a general sense of resignation amongst public sector workers. Yet, campaigns are springing up in defence of local services, from the Roddens care home in Ballymoney to mental health day centres and the Mater A&E unit in Belfast. Even small victories will help to rebuild confidence and point the way forward. All unions and trade unionists should rally around these campaigns as important stepping stones towards the co-ordinated and escalating campaign of action which will be necessary to challenge the austerity agenda. The agreement makes provision for the formation of an official opposition at Stormont for the first time since the Assembly was established. Yet, this will be of little consequence if it is made up of parties like the UUP or SDLP. All the main parties are wedded to austerity and neo-liberal economics which can only deliver a future of poverty, unemployment and hopelessness. These parties which are based on and reliant upon sectarian division are incapable of ever overcoming it. Indeed, they will instinctively whip up sectarian tensions in order to distract from the cuts they are implementing. Increasingly, Stormont seems stuck in the dark ages, continuing to deny LGBT equality against the wishes of 68% of the population. All the main parties oppose a woman’s right to choose.